Submitted Photo Once the semester began, several students showed interest in this organization, particularly during homecoming week. Events such as the breast cancer awareness seminar and the Pink Ball helped contribute to awarness and fundraising for Breast Cancer Month. 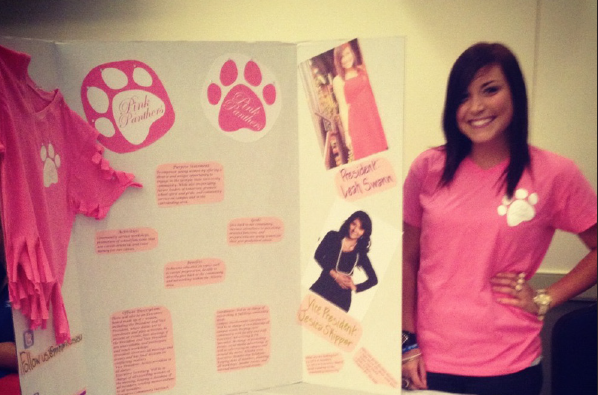 With a mission to bond women at Georgia State while also having a positive impact on the University, community and surrounding area, Leah Swann and Jessica Skipper founded the Pink Panthers club. On April 23, 2012, they established a club they hope will help better the Atlanta community as well as promote Panther Pride among the women at Georgia State. “We wanted a place where strong, sophisticated women could come together and talk and just be around other likeminded women and empower themselves,” said Swann. Inspired by Michelle Obama’s ‘Let’s Move!’ campaign, the club held their own ‘Make Your Move Day’ at Parkside Elementary School. They had different stations set up in the playground to teach kids how to make healthy snacks and how to make nutritional food choices. For the month of October, the Pink Panthers hosted a Pink Week in the spirit of Breast Cancer Awareness Month. The first event was a tailgate at the Homecoming game. It was sponsored by RedBull and all the funds were donated to Breast Cancer awareness foundations. A DJ was there in the RedBull MXT Truck as well as some home cooked food made by Swann’s mom. On Thursday, Oct. 25, every club at school was challenged to find a way to turn the school pink. “At first we were just going to have everyone wear pink but then we thought why not make it a competition? Who can think of the most creative way to turn something at school besides their clothes pink?” Swann said. 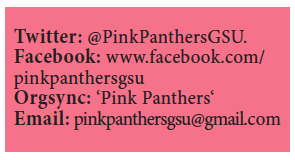 On Nov. 26 at 3 p.m, the Pink Panthers have arranged for former Mayor Shirley Franklin to speak on campus. Both Swann and Skipper want to arrange for more strong women to speak to the female students at Georgia State. While the Pink Panthers was created specifically for Georgia State women, any men who wish to join the club wouldn’t be turned away. Since they are a new club, Swann and Skipper are accepting new members year round. “Other students should join because it’s a good opportunity for women to get involved on campus with networking and workshops and a speaker series. It’s a place for women on campus to come meet other women that are interested in the same things as them,” said Swann.